This fall, the Wesleyan Student Assembly (WSA) is making strides toward improving accessibility to and affordability of textbooks through its first-ever Textbook Exchange. The unfortunate reality for many college students is that the biannual purchasing of textbooks poses significant financial barriers to course selection and academic success. 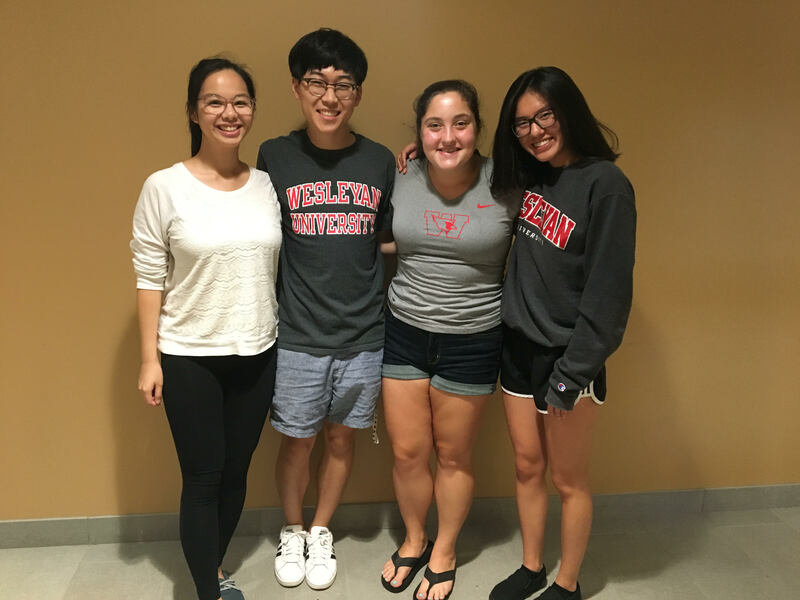 WSA Senators Roseanne Ng ’19, Ariel Deutsch ’21, Pauline Jaffe ’21, and Jake Kwon ’21 facilitated this initiative and its soft launch in Usdan this past week. The Exchange provides Wesleyan students with a physical location where they can sell and purchase textbooks at prices determined by each student seller. Public databases and spreadsheets are being used to record textbook inventory and can be viewed in advance from the comfort of students’ dormitories before they arrive at the physical location to retrieve the books. Cash and Venmo are accepted as forms of payment. Inspired in part by Wesleyan’s annual Waste Not student-run tag sale, the WSA furthered the campus-wide efforts for increased affordability and sustainability in developing the Textbook Exchange last spring. Since the early stages of development, members of the Textbook Exchange initiative have sought guidance from Philip Miller, the Education Committee Chair of Tufts’ student government and the Executive Director of the Tufts Textbook Exchange. Having spearheaded the Tufts Textbook Exchange which is now beginning its second year, Miller was able to provide valuable direction to the WSA senators and share promising statistics on the success he has seen at Tufts. Miller expressed that Wesleyan was the first school to reach out about setting up an exchange similar to the one at Tufts after learning about the initiative in Tufts’ student newspaper, The Tufts Daily. Since Wesleyan began collaborating with Tufts, Miller and the rest of the Tufts leadership team have been in contact with other universities interested in similar initiatives. The growing coalition of universities involved in the Textbook Exchange Program is not only cultivating networks between students on campuses but is also creating a network among schools where a collective effort for educational accessibility and affordability is emerging. When communicating with the administration, Deutsch cited an estimate by the College Board that students spend $1,200 on textbooks per year. Deutsch also mentioned a study conducted by US PIRG, which surveyed 2,000 students at over 150 universities and found that 65% of students said they do not buy textbooks because they are too expensive, 48% of students choose what classes they take based on textbook costs, and 94% of students who did not buy textbooks said they were concerned their grades would suffer as a result. After numerous discussions and logistical meetings with the administration, the WSA senators voiced confidence that further cooperation with the administration and RJ Julia will lead the campus community to a more permanent solution to this common problem. “We applaud the students for their work in launching the textbook exchange, and we support initiatives that help make a Wesleyan education more affordable. We look forward to seeing how it works in its inaugural year,” Manager of Media and Public Relations Lauren Rubenstein wrote in an email to the Argus. Moving forward, the WSA Senators that spearheaded this project anticipate that spreading the word about the Textbook Exchange will make it an effective resource for students that will exist beyond their time at Wesleyan.